I’ve read many books about writing. My favorites are William Zinsser’s On Writing Well, Steven Pressfield’s The War of Art and Anne Lamott’s Bird by Bird. All terrific books. I thought, then, I’d share my five step plan for writing a book. Those books are great, but this is the real truth. Take it as you will, but this is largely how the process goes. 1. Come up with an amazing idea. Know in your head this book will be a blazing bestseller and change the world. Annoy your friends by always talking about it. When they get too annoyed, mumble under your breath in casual conversation about how your book is going to answer that question or some such thing. Keep this up for about a year before you actually start writing. It’s important. 2. About once a month, sit down to work on the book. Go to a coffee shop and set up your computer on the table by the window. Look out the window for inspiration and notice how many cyclists run the stop sign outside the coffee shop. Think for a long time about how hard it is to actually stop a bike and then restart it and how long it would take to get across town if you actually stopped at every stop sign. Google how much you’d be fined if you get caught. Leave the coffee shop without having written. Blame it on the pastry that gave you a sugar crash. Promise yourself the next time you have a writing session you won’t eat a pastry. 3. Search the internet for images you might use for a cover. Look at other books on Amazon and study their covers. Print one of the covers and cross the authors name out to write yours. Use liquid paper if you can still find any. Sniff the liquid paper and wish they hadn’t started putting the chemical in it that makes it smell bad. Wipe the liquid paper off your nose with the napkin they gave you with another pastry. Blame the fact you didn’t get writing done on another sugar crash and the fact you sniffed liquid paper. 4. Rent a cabin. Get very serious about the book. It’s time. Pay good, hard earned money and hole yourself up in the woods to write the book. Bring with you a copy of Walden. Then, obsess about who is and isn’t following you on Twitter for half the first day. Get angry at yourself for being distracted and throw your phone into the woods as a sacrifice to your craft. Go to bed promising the next day you’ll really write. 5. Spend the next morning rummaging around the woods looking for your phone.When you find it and it doesn’t work, go back into the cabin and lay on the kitchen floor, preferably a cold, tiled kitchen floor. Look upward at the oven and lament the fate of Sylvia Plath. Wish, though, you could have a book published like she did before she took her life. Wonder to yourself how happy she must have been having had a book published, so happy she took her life. Pack up your stuff and head home, having written nothing. If you repeat these steps for about eighteen months, you should get a book out of it. I’ve done it many times and it always works. I don’t know when the writing happens. I can’t remember that part. But a book comes. Of course, the point is writing is hard. To write is to struggle with your sanity, at times. And there will be bad days and you will feel defeated. This work is more difficult than climbing a mountain because you are doing it in the dark. I want to urge you to keep going. You matter and your words matter. By writing, you are saying to God I agree with you, you gave me a voice and the gift was not in vain. By writing, you are showing up on the stage of life rather than sitting in the comfortable theater seats (there is a time for both) and are casting your voice out toward an audience who is looking for a character to identify with, somebody to guide them through their own loneliness, no matter how transparent or hidden that loneliness is. And so if you find yourself on the floor of the kitchen (and I am no longer joking. I mean that in the Plathian sense, if you are finding yourself despondent) please know you are not alone. So many writers have been there. And the ones whose voices continue to echo through the theater got up, went back to their desk, and prayed again for words. May they come to you. And may they be gifts to us. In closing, to those who have closed the door on religion — I was recently asked by a non-Christian friend if I thought he was going to hell. I said, “I hope not. It will be hard to enjoy heaven without you.” If those of us who believe in God do not believe God’s grace is big enough to save the whole world… well, we should at least pray that it is. But why can’t I stay away? Why can’t I just stay away from you? You sent the locks flying away? Then you just had to happened, don’t you? ~This is written by Marichelle Boiles; she allowed me to publish this since she’s never gonna publish it on her blog – like she’s never gonna ever admit her feelings for a possible true love. This is her, writing her heart out for the PTM guy (I forgot what PTM means). She’s a super writer, see? Your generation is extremely lucky because technology has made you more powerful than the generations before you. Even though I’m much older than you, this is also my graduation year: the year I left traditional media to start a new media company called Rappler. All around the world, the Internet is turning businesses upside down. Society is shifting beneath our feet. Last week, Facebook bought Instagram, a company that was a year-and-a-half old with 13 employees, for more than a billion dollars. It’s a flat world today where a small start-up like Rappler can compete against established, better-funded newsgroups. It’s a world where ideas can come from anywhere around the world and travel in the blink of an eye. Ideas from you here in this room now reach decisionmakers in ways never possible before. Managers my age are trying to understand a digital world that comes naturally to you. So you’re actually entering the workforce with an innate advantage: you don’t have to unlearn the baggage of the past, and you’re better prepared to take risks and discover this brave new world. Technology has made you as powerful as your future employers. You’re coming of age at a time when your inputs are as valuable as those much older than you. The virtual world is just like the real world – but faster with no boundaries. It’s a world where people, ideas and emotions travel through densely interconnected social networks. The Philippines, according to ComScore, is the world’s social media capital, and Facebook connects 845 million people around the world, the largest ever in the history of man. How many of you here have Facebook? That’s both a positive and a negative for you because I think it makes it harder for you to deal with the challenge that faced generations before you: how to build meaning into your life. Meaning is not something you stumble across nor what someone gives you. You build it through every choice you make, through the commitments you choose, the people you love, and the values you live by. For me, it begins with the choice to learn. Learn all the time. Learn all your life. Learn from your successes, but more importantly, learn from your failures. When I was about a year older than you, I became a CNN reporter. Like most things in life, I stumbled onto this. I’m a behind-the-scenes person – a producer and director, but for whatever reason, CNN made me a reporter, and I was scared. To me it translated to “be more arrogant” – I had a pet peeve about a way of being on camera – that air of knowing everything hits me as arrogance. I didn’t want to pretend I knew everything because I didn’t. Over the years, I learned that being on-camera is the most unnatural way of being natural. It’s about self-confidence, but there’s a thin line between self-confidence and arrogance. So I watched myself – you know how hard it is to watch yourself? – and I kept doing it over and over again until I was happy. I put in my 10,000 hours – that’s the amount of time Malcolm Gladwell said it takes to become an expert at anything. That’s the point when you start to create – when it fully becomes you. Being a reporter shaped a lot of who I am today: the ability to walk in anywhere, make quick judgements, ask tough questions, speak plainly. It all began with that moment of failure. I’m very lucky to have lived through journalism’s golden age. I reported on Southeast Asia’s transition from authoritarian one-man rule to democracy. I had a front-row seat to history: Lee Kuan Yew stepping down in Singapore, the riots leading to the end of Suharto’s 32 year rule in Indonesia, Mahathir ending 24 years as Malaysia’s Prime Minister – so many more. From politics to economics to disasters, social upheavals and terrorist attacks, I was there. I’ve seen the best and the worst of human nature. In West Kalimantan, I watched young boys playing soccer in a field. Except when I got closer, I realized the ball they were using was the head of an old man. That weekend, I saw 8 people beheaded and nearly threw up at a checkpoint where a man was eating a human foot like a drumstick while a decapitated head was on a metal drum next to him. I saw 600 people buried in a mass grave and wondered where God was. I have been shot at and stoned. I’ve learned South Korea has the most painful tear gas. I’ve run for my life and used my body to shield one of our interns after we were caught between protestors and the military. I’ve learned it’s easier to risk my life than those of others who trust me. I’ve learned my greatest enemies are boredom and complacency. When I stop learning or I feel like I’m on auto-pilot, I know it’s time to move on. It took nearly 20 years of travelling the world for breaking news before my search for meaning pushed me to look beyond CNN. It brought me back home to the Philippines. It was time to stop writing about what other people were doing and build something again. Six years heading ABS-CBN’s news group taught me how to manage Filipinos and how difficult it is to build institutions in this country. It gave me an up-close look at the problems of our society – the problems I hope your generation solves. I learned people will try to coerce, manipulate, intimidate or threaten you to get what they want. Often, they have a lot at stake, big money, sometimes their lives. And you have to be clear about what you’re afraid of because those are buttons they will push. Which brings me to the role fear will play in your life. Some people do their best to avoid what they fear. Even when I was younger, I felt that gave fear too much power, and in the process, it begins to define you. So I thought – well, what’s the worst thing that can go wrong? I’ll fail? Remember what I said about failure. Seek it out. Remember the phrase: what doesn’t kill you will make you stronger? It worked for me. What doesn’t kill me will make me stronger. That’s why I believe it’s so much better to confront your fear than it is to run away from it – because when you face it, you have the chance to conquer it. In doing that, you define who you are. I’ve learned that the worst fears are not what other people can do to you. What’s harder is when you are alone and answer the tough questions of every day life: What do you stand for? What do you believe in? How far will you go to stand up for what you believe? This is your moment to draw your lines. When I was your age, I didn’t set out to fight corruption. That battle found me. The company I helped form in my 20s, Probe, began one of the first public battles against it. At the end of each program, we said Probe supports the fight against envelopmental journalism. Over the years, I discovered how endemic corruption is the root of much of what’s wrong in our country today. In ABS-CBN, I took a zero tolerance approach to corruption: both for our people and those who tried to bribe us. It started because I drew a line when I was your age. This is your moment to draw your lines. There are some simple truths. The more you say no, the easier it becomes. The more you do the right thing, the harder it is to do the wrong thing. It’s a tipping point approach to building your identity. My line in the sand was defined long ago – when the fiancée of one of my closest friends offered me $150,000 to do a story for CNN. It wouldn’t be traceable, he told me, and it would be deposited directly into my bank account. He gave the offer over lunch, and although I wanted to say no immediately, he held my hand and said, please take at least a night to sleep on it and think about it. I was shocked. I didn’t even tell my friend. That night, I thought about it. But then reality stepped in. My sense of self is tied to being a professional journalist, and I couldn’t look at myself in the mirror if I accepted the bribe. I had drawn the line clearly, and I knew that accepting that money would make me a fundamentally different person. On this side of the line, I’m good. On the other side, I’m evil. On this side, I’m clean. On that side, I’m corrupt. It’s that simple. Remember that evil people don’t think they’re evil, and corrupt people don’t think they’re corrupt. Corruption is endemic in our country because people rationalize it. They split hairs about definitions. It takes all of us to keep it that way or to change it. The only way it will change is if more of us take a stand against it and refuse to tolerate it. This is the time to define your ideals because it only gets murkier the older you get. People will tell you “you’re naïve.” They’ll say “it’s the way things are done.” Don’t believe it when people say that. The choice is always yours. Choose to do better. Which brings me to the last lesson I want to share with you today. You have to have the courage to say no. Corruption will be significantly reduced if everyone in this room today said no. No to your friends who say it’s ok to do what everyone else is doing. No to your family. Because that is how corruption spreads. Through our social networks. All of us like to be liked, but remember that being part of any group carries a price. Studies show that peer pressure actually distorts reality so be careful the friends you keep. People will do things as part of a group that actually go against their morals or even harm others. We Filipinos believe in social harmony, SIR – smooth interpersonal relations, but I’ve seen too many people stand by while the group does bad things in their name. Take responsibility for the world you are creating. Let me end the way I began. Now more than ever, technology will give you more power, make you more interconnected. While that is exciting, I think it may make your fundamental search harder – the question we all set out to answer. How do you build meaning into your life? I’ve given you some of the lessons I learned in trying to answer that question. In the end, you can put all those lessons into this one sentence. You build meaning by choosing what you commit to: whether it’s a cause, a religion, an ethical order, the people you love, the nation you are creating. The ingredients are there. You are the only one who can put them together in the unique pattern that will be your life. Do it with your eyes open and remember this self, sitting there, so you can remind your future self about the lines you draw now. I made a vow to myself a long time ago when I was sitting where you are now: I would never say or do anything I didn’t believe in. I maintain a healthy distrust of herd mentality. I’ve kept those vows to my younger self, and everytime I face a difficult choice, I remember the lines I’ve drawn. I think this is why I can stand before you at nearly half a century old and tell you it’s possible to live your ideals. You do not have to compromise. Take a stand and change the world. We’re counting on you. Maria A. Ressa delivered this speech at the 84th commencement exercises of the Far Eastern University, Manila, on April 18, 2012. This speech was just so brilliant in so many ways I don’t even know where to start! Miss Maria Ressa, I salute! •Meaning is not something you stumble across nor what someone gives you. You build it through every choice you make, through the commitments you choose, the people you love, and the values you live by. For me, it begins with the choice to learn. Learn all the time. Learn all your life. •Learn from your successes, but more importantly, learn from your failures. • I put in my 10,000 hours – that’s the amount of time Malcolm Gladwell said it takes to become an expert at anything. That’s the point when you start to create – when it fully becomes you. •It all began with that moment of failure. •I’ve learned my greatest enemies are boredom and complacency. When I stop learning or I feel like I’m on auto-pilot, I know it’s time to move on. •I learned people will try to coerce, manipulate, intimidate or threaten you to get what they want. Often, they have a lot at stake, big money, sometimes their lives. And you have to be clear about what you’re afraid of because those are buttons they will push. •Even when I was younger, I felt that I gave fear too much power, and in the process, it begins to define you. So I thought – well, what’s the worst thing that can go wrong? I’ll fail? Remember what I said about failure. Seek it out. Remember the phrase: what doesn’t kill you will make you stronger? It worked for me. What doesn’t kill me will make me stronger. •That’s why I believe it’s so much better to confront your fear than it is to run away from it – because when you face it, you have the chance to conquer it. In doing that, you define who you are. •I’ve learned that the worst fears are not what other people can do to you. What’s harder is when you are alone and answer the tough questions of every day life: What do you stand for? What do you believe in? How far will you go to stand up for what you believe? •This is your moment to draw your lines. There are some simple truths. The more you say no, the easier it becomes. The more you do the right thing, the harder it is to do the wrong thing. It’s a tipping point approach to building your identity. •I had drawn the line clearly, and I knew that accepting that money would make me a fundamentally different person. On this side of the line, I’m good. On the other side, I’m evil. On this side, I’m clean. On that side, I’m corrupt. It’s that simple. •Remember that evil people don’t think they’re evil, and corrupt people don’t think they’re corrupt. Corruption is endemic in our country because people rationalize it. They split hairs about definitions. It takes all of us to keep it that way or to change it. The only way it will change is if more of us take a stand against it and refuse to tolerate it. •This is the time to define your ideals because it only gets murkier the older you get. People will tell you “you’re naïve.” They’ll say “it’s the way things are done.” Don’t believe it when people say that. The choice is always yours. Choose to do better. •Take responsibility for the world you are creating. •You build meaning by choosing what you commit to: whether it’s a cause, a religion, an ethical order, the people you love, the nation you are creating. •The ingredients are there. You are the only one who can put them together in the unique pattern that will be your life. Do it with your eyes open and remember this self, sitting there, so you can remind your future self about the lines you draw now. •I think this is why I can stand before you at nearly half a century old and tell you it’s possible to live your ideals. You do not have to compromise. •Take a stand and change the world. We’re counting on you. That will put in the time, heart and effort to pursue you. None of this whole chasing-around-boys-who-don’t-really-like-us-and-pine-when-they-reject-us business. Wait for God to set you up with one who will put in time to win your heart. How can He do that if you’re throwing it at Him? Be secure enough in yourself and your Father that you don’t need to throw your heart around and give it away to any man who winks his eye at you. Be a woman, secure in God, deadly to the devil, feminine in strength, purity and tenderness. Give your man a chance to be a man. Let the boys who blow you off and expect you to let them walk all over you or just plain won’t put in effort to get to know you at all go. Let them go, and position yourself as a woman satisfied in herself and her life. Give yourself to the all-knowing God, give yourself to loving others, and your man will come alongside you. You will never have to strive to make him like you, to make him talk to you. He will be already a man in pursuit of your heart without your help. Although I just recently pass through the Teen Years, I still feel that I belong to that same age group. Well, twentyteen is not too far an age, right? :P But seriously, I admit that I haven’t reached maturity yet–in thinking, speaking, acting and even dressing up. I’m still a big fan of Miley (even when she changed her image); my ultimate favorite movie is still A Cinderella Story; I don’t have a nose for classic literatures yet, instead, I’m addicted to chic-flicks; I still wanted “wished” for people to somehow notice me all the time; most times, I don’t walk my talk; I still wanna look good in front of others; and I still think that when a guy smiles at me or talks to me nicely that he just might be the one for me (I can go weirder than that). Do you ever or do you still have those problems too? Or is it just me all along? Ha! Unfair. Real maturity depends on how one define maturity for themselves. But when it comes to boys—sometimes it’s a whole different story altogether. You know, I’ve never been in any relationships EVER. Ergo, I don’t really know what is going on there. However, I’ve always been waiting…waiting…waiting…and waiting…waiting patiently for someone who would be willing to go in that journey with me. I’ve always known the virtue of waiting–the best is yet to come. For single ladies like me, though, it seems like the best is stuck in a gigantic maze somewhere which makes it harder for them to find us. Thus, makes the waiting all the more challenging for us to do. It’s easy to give in, the world is generous and will give you a handful of choices. But you see, the world only offers good and better, there’s only One who could give you the best in life. He wanted to give us the best and we ought to wait for it expectantly, not losing heart. We don’t need to give in and lower our standards and our quest for something perfect. Believe that the perfect (one who would really suit you) will come. Believe it and it will. Ladies, we are God’s princesses. What does princesses deserve? Princes, right? Somebody once said, carry yourself like a queen and you’ll attract a king. A queen will never settle for anything less than the best; she knows what she deserves. Same thing for us. Never lower your expectations with the guys. Never compromise your standards. Life would be sweeter if your prince will go a long way–thorns, bush and all–to find you in the arms of your Father. Then, isn’t it a life worth having? Isn’t it a man worth waiting for? 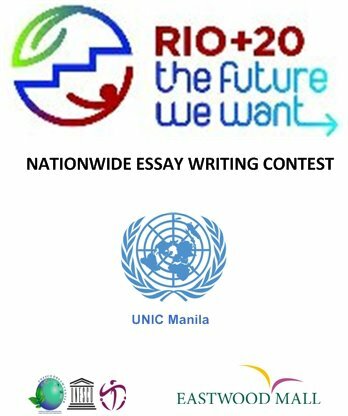 Is a Nationwide Essay Writing Contest. 1. The contest is open to all Filipinos, 16-22 years old. Contestants may or may not be currently enrolled in a Philippine school/college/university. 2. Contestants must describe in as much detail as possible the features of a future world they would like to see—The Future They Want—in no more than 2500 words. The content of the essay must adopt as much as possible the advocacy underlying the UN Conference on Sustainable Development, or the Rio+20 Summit. 3. All essays must be written in English. 4. Essays must not only “read” well but must also “sound” good when “read aloud.” Shortlisted essays will be read on-camera by their writers and the video, webcast. 5. The deadline for submission of entries is on 11 June 2012, 5:00 p.m.
6. Entries must be sent by email to: unic.manila@unic.org, with a copy to: teresa.debuque@unic.org. Indicate in the subject line: “The Future We Want” Essay Writing Contest_(Your Full Name). 7. An email acknowledging receipt of entry will be sent to the applicant. 8. A shortlist of 10 entries will be chosen by a panel of judges on 12 June 2012. 9. The writers of the 10 shortlisted entries will be invited to undergo a verification exercise—an on-the-spot writing test. 10. Once the shortlisted candidates have passed the test, they will be invited to read their essays on-camera at the Venice Piazza at McKinley Hall, on 15 June 2012. 11. Video of the essay-reading will be streamed on UN Webcast as well as on various social networking sites on 20 June 2012—the opening of the Rio+20 Summit. 13. A panel of judges will determine the top 3 winners on 13 July 2012. 14. The awards will be handed out in a ceremony to be held on 16 July 2012 at the Atrium of Eastwood Mall. 15. The First Prize Winner will receive P15000 and a trophy; the Second Prize Winner, P10000 and a trophy; and the Third Prize Winner, P5000 and a trophy. A “People’s Choice Award” will be given to the winner of the online poll. 16. The top three winning entries and the People’s Choice Essay will be published in a newspaper of national circulation.